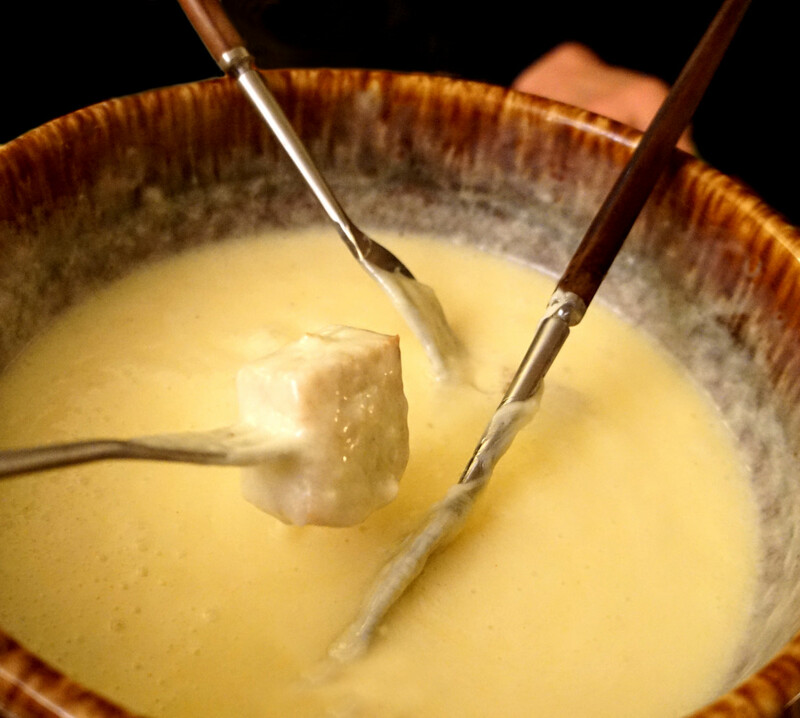 To put it simply, a traditional cheese fondue recipe requires taking a whole lot of cheese and slowly melting it in a pot of warm white wine. The melted cheese is then scooped up with small cubes of bread. It is a gorgeous concoction that tastes like a grilled cheese sandwich and a glass of wine all at the same time, only with the cheese on the outside of the bread and the wine enveloping everything. Salivating yet? 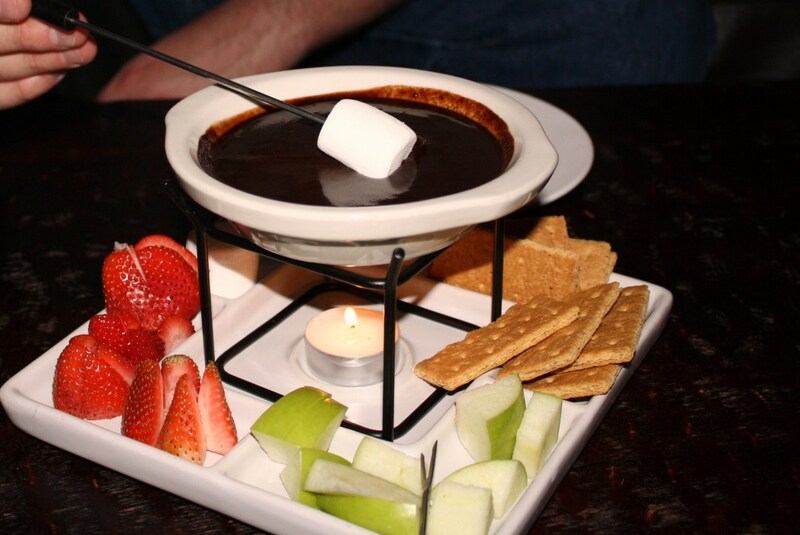 In truth, the only thing that really tastes like fondue is fondue, so you will just have to try it for yourself. You should be able to prepare all the ingredients in 15 minutes, and the cooking time is only around 10 minutes. So, in less than 30 minutes, you can have everyone around the table enjoying a warm and filling feast. 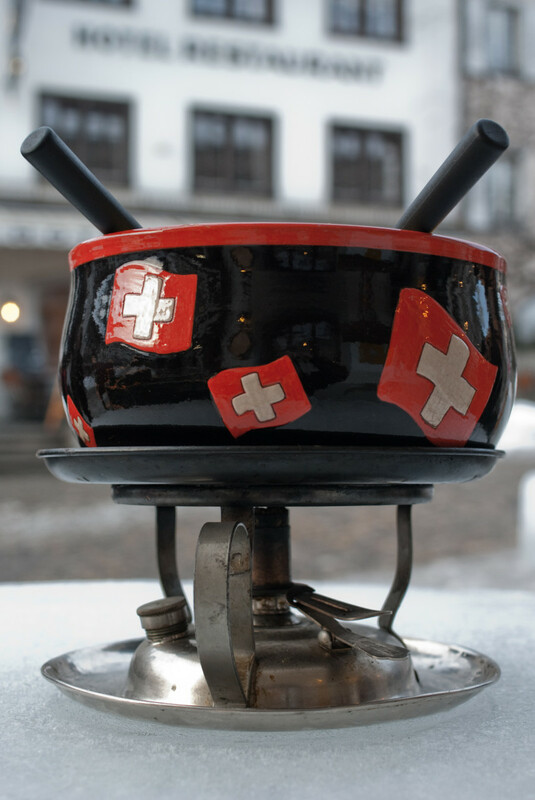 A fondue is very much a social event, but tradition states that the first person to drop their bread in the pot has to do the washing up, so take care with your dipping! Cut (or tear) the baguette into bite-sized chunks of bread. Each piece needs some crust so that it can be speared by a fork. Grate all the cheese, or cut it into small 1/4" (10mm) blocks. Grating it is usually quicker and easier. Put the grated/cubed cheese in a bowl and mix in half the cornstarch. This is to stop the cheese from sticking together too quickly. Do this by hand and ensure there is a fine coat of cornstarch on every last piece of cheese. This may seem like overkill, but it makes a huge difference! Cut the garlic clove in half and wipe it around the inside of the pot to leave the essence of garlic in there. You can now throw away the garlic. Mix the remaining cornstarch, mustard powder, and kirsch together. Pour the wine and lemon juice into the pot and slowly bring them to a boil. Keep the heat low and wait until bubbles start appearing in the wine at the base of the pot. Now start to add the cheese a small handful at a time. Using the handle of a wooden spoon, or perhaps a strong chopstick, stir the cheese in the pot in a figure eight pattern. Once you start stirring, you cannot stop until all the cheese is added. But don't rush. Just keep adding the cheese a small handful at a time and wait until it has melted before adding more. The mixture should now be thick and creamy. At this stage, pour the cornstarch, mustard, and kirsch mixture into the pot. Remove the pot from the stove and put it on the table with a heat source underneath it. You can stop stirring now, as your guests will continue to churn the cheese with their bread. Grate some nutmeg into the pot, and you are ready to serve. Runny: If your fondue is too runny, add some more cornstarch, but only a little at a time. Next time you make this dish use just a little less wine or a little more cheese. Lumpy: If your fondue is too lumpy then, alas, there isn't much you can do. You can still enjoy it but next time make sure your cheese is in smaller cubes or grated pieces and that the cornstarch is on every single piece. Also add the cheese a little more slowly so that it all gets the chance to melt. Separated: If your fondue starts to separate, continue stirring it in a figure eight. It will come together eventually. This one's for the meat lovers out there. If a cheese fondue with bread and a side salad seems a little too vegetarian for you, then allow me to introduce fondue bourguignonne—the famous meat version. It uses the same principle as the former but replaces the melted cheese with boiling oil and the cubes of bread with cubes of raw beef. It makes for a wonderful meal that is very hearty and filling. If you have enough guests for dinner, you can have a cheese fondue and a meat fondue at the same time! "Bourguignonne" indicates that the fondue hails from the Burgundy region of France, which historically was also a part of Switzerland. Cut the beef into 1" (25mm) cubes, or slices of that size. Don't go too small, or you won't be able to spear the meat and keep it on the fork. Heat the oil in the pot until it is boiling. Transfer the pot to a burner on the table and keep it boiling throughout the meal. Spear a piece of beef with your fork and place it in the boiling oil. When you think your beef is cooked, remove it. This is the beauty of this dish—you can have the beef as rare or as well-done as you like, every time. Dip the beef into the various sauces and spices, then remove it from the fork and place it on your plate. Unlike a cheese fondue, you do not put the meat on the fork directly into your mouth. The metal fork has just been in boiling oil, and it is hot and may burn your mouth and lips! Enjoy this dish with a side salad, some fried potatoes, vegetables, or anything else that you enjoy with regular steak. 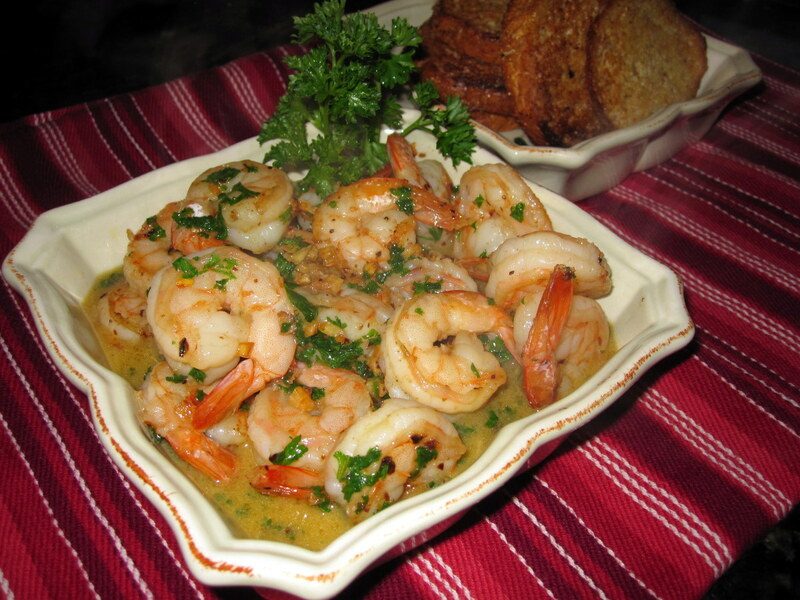 Serve with red wine, beer, or anything else that takes your fancy. You still have room for more? And you love chocolate? Read on. If you still haven't had enough fondue, let's make a delicious chocolate version! Think of the traditional cheese recipe, but with melted chocolate as the liquid and marshmallows (or fruit, because you are healthy!) in place of the bread. Though you can use a regular caquelon to make this, it might be a little large. If this is the case, you can buy a smaller pot specifically for chocolate fondue. To maintain the authentic Swiss style, you might want to follow this recipe, as it uses Toblerone bars. Break the Toblerone into the triangles. You might want to get multiple small bars so that the triangles are smaller and easier to melt. Put the triangles into the pot. Using low heat, and stirring all the time, melt the chocolate into the cream until the liquid is smooth. Transfer the pot to its burner on the table and start to eat! Use marshmallows, strawberries, bananas, candy, apple slices, etc. 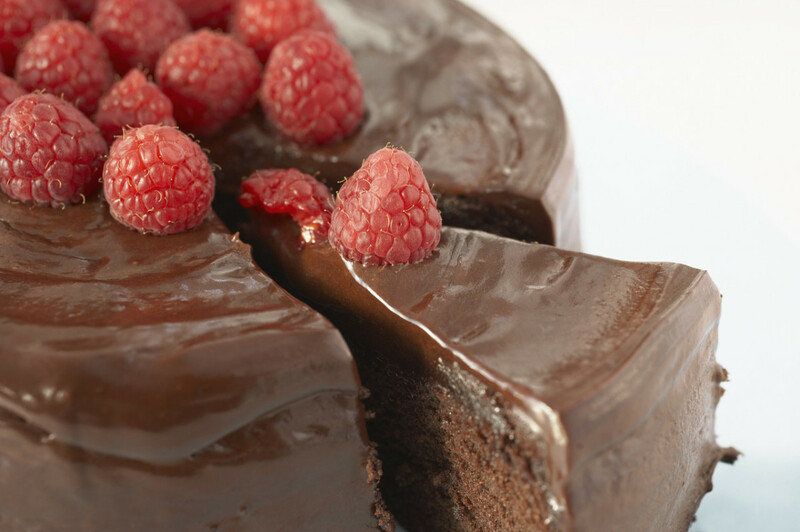 to dip into the chocolate, and eat to your heart's content. Organic Chocolate Fondue Recipe With Chocolate Martinis! To make this dish just right, you have to make sure that you get the right ingredients and that you mix them properly. Nobody likes a lumpy fondue, and a runny fondue isn't much fun either. So while you are learning, take your time and get it right. Here is a brief explanation of the different ingredients and materials needed for a traditional fondue. Traditional recipes use an equal mixture of two kinds of cheese—usually Gruyère and Emmental. Emmental is the famous Swiss cheese with holes in it, and along with Gruyère, it helps to give this dish the perfect consistency. You will always need to use some Gruyère, but you can substitute your Emmental for similar cheeses if your local store doesn't have Emmental in stock. The cheese I prefer to use is Norwegian Jarlsberg to add a Nordic mix into my Alpine dish. Like Emmental, it too is very holey. The ideal wine for your authentic fondue is the Swiss Fendant dry white, made from the Chasselas grape variety grown in Switzerland, France, Germany, and New Zealand. It is quite hard to source decent Swiss Fendant wine outside of Switzerland. I've been known to buy bottles to bring to the UK whenever I've been on business trips to Zurich and Geneva just to have some in the wine rack. 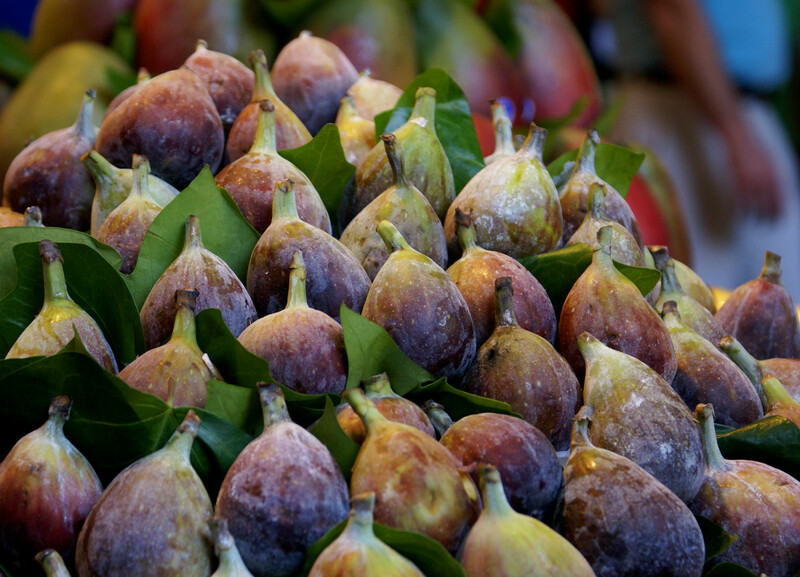 If you can't get hold of genuine Fendant wine, then look for other wines that are made from Chasselas grapes. If all else fails, go for the driest white wine you can get your hands on. Finally, you need the right materials, namely a traditional earthenware pan. This pan is known as a Caquelon or caclon. I prefer to use a pan for cheese fondues, and a purpose-built pot for meat and chocolate fondues. See the notes further down this page for more information. You can melt your cheese in the Caquelon on the stove, but when you transfer it to the table, it still needs a heat source, so a methylated spirit burner and a stand are also required. How Do You Eat Fondue? Spear the small bread chunks using a fondue fork—a special fork like a small toasting fork—and dip it into the pot. 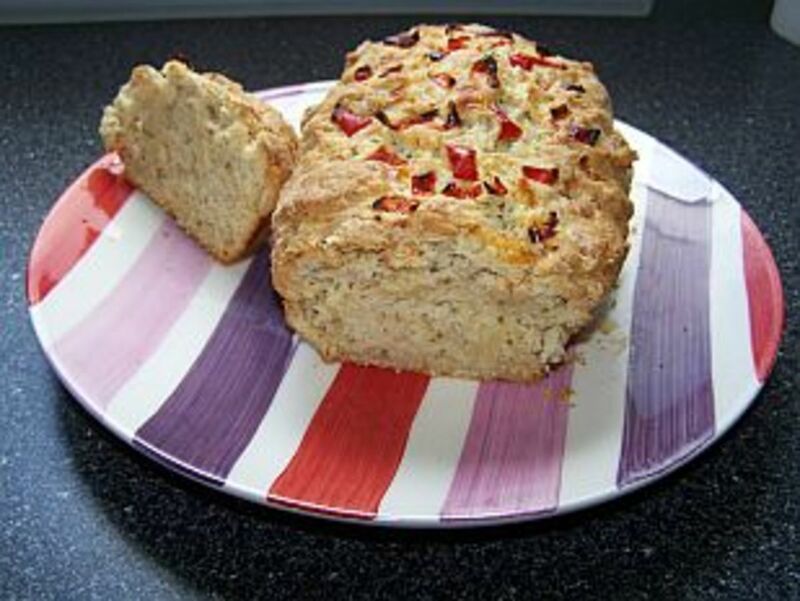 Swirl the bread around to pick up the cheese and then eat. Simple and delicious! What Can You Dip in Fondue? You can dip vegetables, and even meats, into your fondue. Cauliflower, celery, and sausages are three of my favorite bread alternatives in fondue. You might find that some things just don't work as well, and the cheese simply slips off, but it is fun to try new foods and think of innovative ways to enjoy this tasty meal. 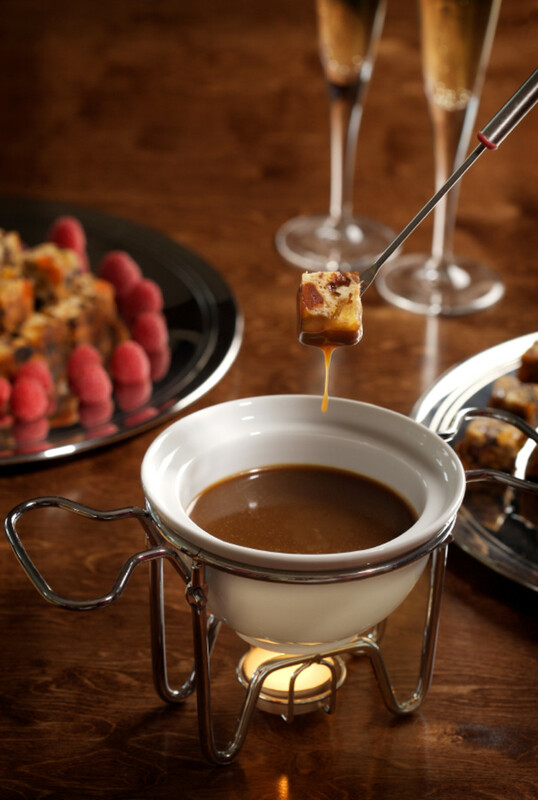 What Do You Serve With Fondue? A salad works well as a side dish. You don't want anything too heavy, as the fondue will certainly fill you up. White wine, but not too cold, is the best drink to have with fondue. If that isn't your thing, you might want a nice red wine on a cold winter's evening. Many people say that beer with fondue is a bad thing, as the cheese and beer just don't sit well in the stomach, but you might find something different in your experience. Still Craving Cheese? Try Raclette! So, you've made it this far and want even more cheese? Allow me to introduce raclette—another Swiss cheese similar to Gruyère and Emmental. Raclette is a Swiss secret that hasn't made it far beyond the country's borders, but if you go to the right places, you can find it. 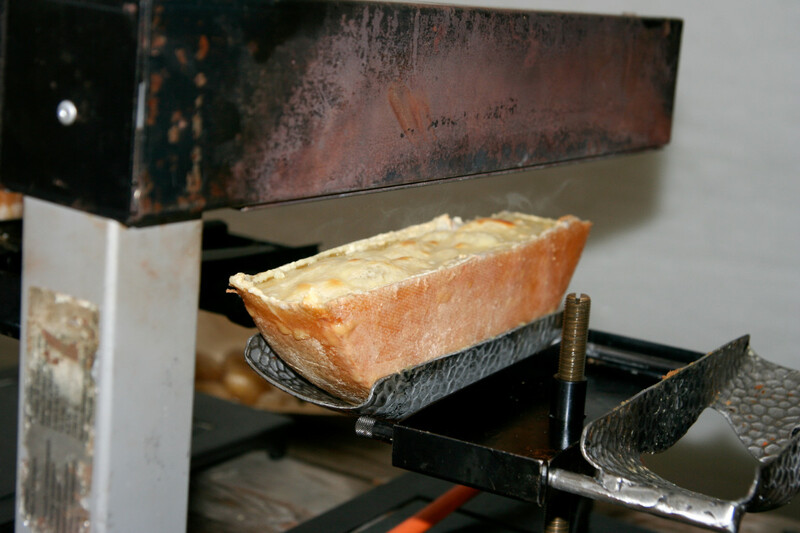 The word raclette comes from the French verb racler which means "to scrape." This should give you an idea of how this dish works. Basically, the cheese is held very close to a heater, as shown in the image. This melts the exposed part of the cheese. It will either be allowed to melt and fall onto a waiting plate or be scraped directly from the block of cheese. This lovely, warm, gooey cheese is then spread on warm bread or poured over boiled potatoes. On the side, you might have a regular salad, along with pickles (onions and gherkins are great), meat slices, tomatoes, etc. Wine and beer go very well with raclette. If you ever get the chance to have one, then treat yourself. It is also great fun to watch a professional scraping the cheese when it is at just the right melting point. Oh yes. 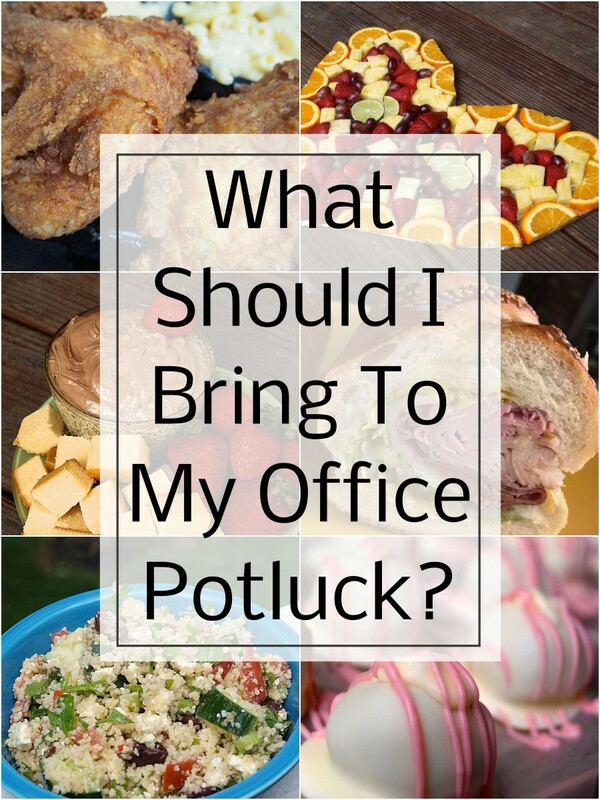 I'm heating my fondue pot after reading this great recipe hub! Well done and certainly delicious. Yummy! I love the right bread with cheese fondue. Fun lens even though I gained weight just reading it. I love fondue and your lens! I was looking for inspiration for a little slumber party I am planning with my baby sister tonight... lol... we are not so young in age but always young in heart:) I believe fondue is in order! I feature your lens in my fondue lens. Thanks for a great lens. Oh Cheese Fondue, my mouth is watering what a delicious lens! Great lens...makes me want to go make some fondue! Wow I love this! What kind of cheese do you use so I can buy if from my cheese shop online! Create unforgettable food and fun with wolfgang puck cookware. Enabling you to make some of the best fondue. Can't get enough of fondue. Love this lens. I love fondue. It's my favorite YUM! PLAYING WITH FOOD Lens! THUMBS UP! I'm pretty sure that i could live on fondue.